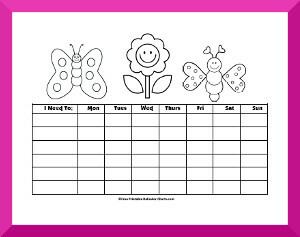 Behavior charts for kids to color! Our behavior charts to color are lots of fun for kids. The way to be successful with behavior charts is to make the process fun and engaging. In addition to picking out a favorite chart theme, have your kids pick out special markers, crayons or pencils to color in the chart. And when the chart is done, display it as a reminder of the special accomplishment! We are happy to make up any charts with new themes for free!